Microsoft has finally done it. Session 0 is officially off limits. 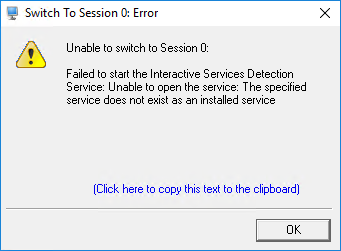 The Interactive Services Detection Service — necessary to switch to Session 0 — has been removed in Windows 10 Version 1803 (released in April 2018). While applications running in Session 0 will happily create windows and prompts, no one will be able to see them. But this is no big surprise. The geeks in Redmond have been marching in this direction for many years. The concept of multiple login sessions in solidified in this foundational release of Windows. Session 0 is created at boot, interactive Windows Services are supported and the first user to log in is placed in Session 0. To avoid shatter attacks, Vista prohibits users from logging in to Session 0. That new world order is dubbed “Session 0 Isolation”. 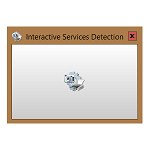 The Interactive Services Detection service is introduced to allow users to temporarily access Session 0 — a band-aid for interactive Windows Services that show windows and prompts. Microsoft continues to discourage interactive services. The NoInteractiveServices registry value, which enables the Interactive Detection Service and switching to Session 0, is set to 1 by default. This prevents anyone from switching to Session 0 (unless the registry is updated). The keyboard and mouse no longer function in Session 0. This unwelcome behavior was widely thought to be a bug that Microsoft would eventually resolve, but it now looks like a deliberate action intended to cripple interaction with Session 0. Microsoft promises to remove the Interactive Services Detection service in this Spring Creators Update but for some reason the service remains. The Interactive Services Detection service is officially removed. Switching to Session 0 is forbidden. 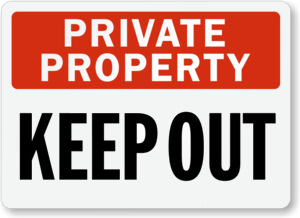 So what exactly are the ramifications of losing the Interactive Services Detection service?